CurrencyThe currency is the Rand, which is divided into 100 cents. There are R200, R100, R50, R20 and R10 notes. Coins come in R5, R2, R1, 50c, 20c, 10c and 5c. To check the current exchange rates, visit www.xe.com.BankingBanks are found in most towns, and are generally open from 09h00 to 15h30 on weekdays and 08h30 to 11h00 on Saturdays (Closed Sundays and Public Holidays). Most of them offer foreign exchange services – with cash, bank & credit cards as well as travellers cheques. You can also obtain cash from automatic teller machines (ATMs). Several international banks have branches in the main city centres. Always advise your bank that you are travelling outside of the country as they might block your purchases if they are not informed. Tap water in South Africa is safe to drink and cook with when taken from taps in urban areas. Not all tap water in rural areas is safe for consumption, so take precautions if necessary. Standards of hygiene in relation to food health and safety in South Africa, are generally high in hotels, restaurants, pubs and nightspots.It is safe to eat fresh fruit, vegetables and salads, and put ice in your drinks. South Africa's fish, meat and chicken are of excellent quality, so there is no need to limit yourself when enjoying the local cuisine.Restaurants are subject to South Africa's food safety control legislation, which is implemented by local government. Regulations include certification and regular inspections by health inspectors to ensure hygienic standards are maintained.Street food is not as common in South Africa as it is in other countries, although vendors selling traditional snacks and meals can be found in city centres and townships. Food safety in such instances cannot always be guaranteed. South African temperatures, which are measured in centigrade, average at highs of 80°F to average lows of 45°F in the summer months while winter temperatures range from 30°F at night to around 65°F in the day.Average annual rainfall is on the low side at under 20 inches a year, making the country somewhat dry. 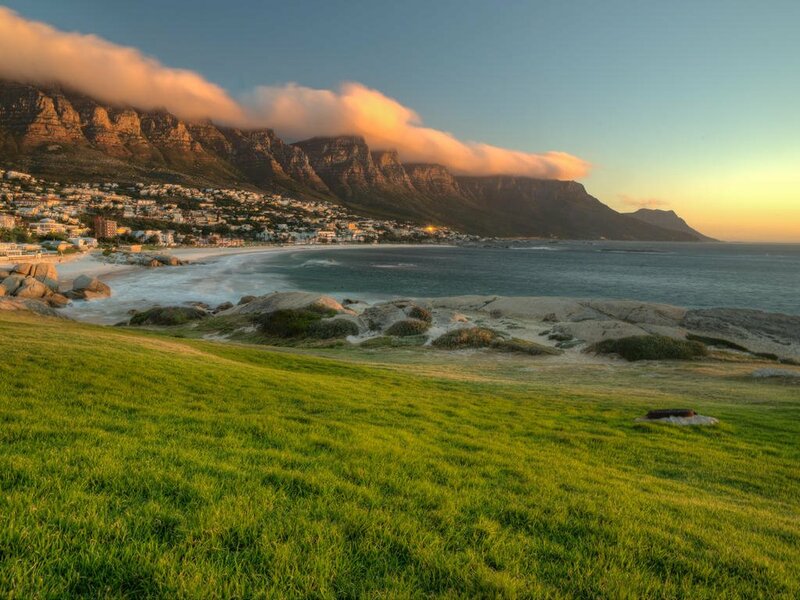 Much of the rain falls in the Western Cape in the winter, differing from the rest of the country, which experiences summer rainfall. 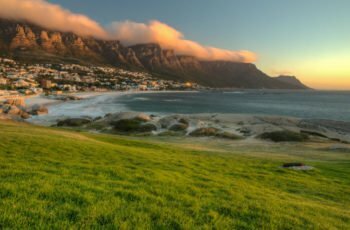 On the plus side, the South African climate boasts more than its fair share of sunshine, recording an average of 8.5 hours a day. 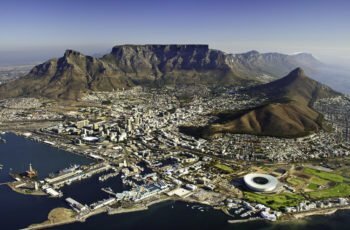 Travelling around South Africa is relatively easy by air, road and rail.Principal air routes are serviced by SAA and British Airways, operated by Comair. There are 2 low-cost carriers on main routes, namely Kulula.com and Mango.Facilitating travel around South Africa are 10 airports managed by the Airports Company South Africa (Acsa). In addition, there are some 90 regional airports, including the Kruger Mpumalanga International Airport in Nelspruit and the Skukuza Airport, offering access to the Kruger National Park.An extensive tarred road system makes travelling in South Africa by vehicle convenient and easy. You will find gravel roads in rural areas though.In South Africa one drives on the left hand side of the road. The speed limit is usually 37-50 mph in built up areas and 75 mph on highways. Safety belts must be used at all times. Overseas visitors must carry a valid international driving license. Should travellers not be in possession of a valid international driving license before leaving their country of residence, they will not be permitted to hire a vehicle in South Africa. Talking on a cell phone whilst driving is an offense and if caught you will be fined. Filling stations are conveniently situated throughout the country. Unleaded fuel is available. Most filling stations are open 24 hours a day. Filling stations are not self-service. Please bear in mind that you are only able to pay for fuel in cash.Another means of getting around South Africa are luxury inter-city bus services such as Greyhound and Trans-Lux. Metrobus buses are available for in-city transport. Metered taxis must be ordered by telephone. There is also a hop-on-hop-off bus in Cape Town and Johannesburg.The rail system includes the long-haul, inexpensive Shosholoza Meyl Metrorail trains. More luxurious options are the Blue Train, Premier Classe and the steam train Rovos Rail. There is also the new Gautrain rapid transit railway system in Gauteng Province which links Johannesburg, Pretoria, Ekhuruleni and OR Tambo International Airport. 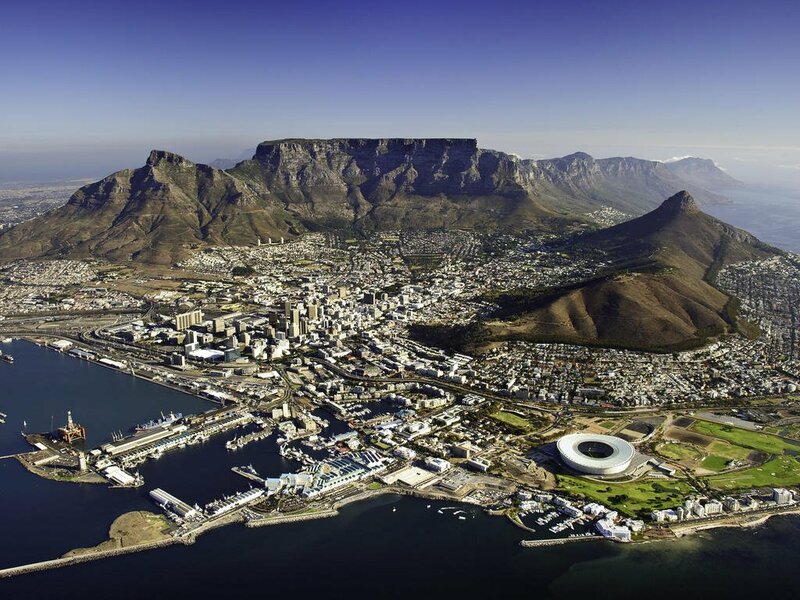 Travelling around South Africa is relatively easy by air, road and rail.Principal air routes are serviced by SAA and British Airways, operated by Comair…. SummerBring clothes that are cool, light and comfortable because summer temperatures can get well into the 85 – 105 degree Farenheti range in some areas.Also bring an umbrella or raincoat during summer as this is when most of the country gets its rain, but don't forget a swimsuit.WinterThe winters are generally mild, comparing favourably with European summers. But there are days when temperatures dive, especially in high-lying areas such as the Drakensberg, so be prepared with jerseys and jackets. Cape Town gets its rain during the winter season so it’s advisable to bring rain gear along.GeneralAlways bring a hat, sunglasses and sunblock as the sun can be strong even in the winter months.Walking shoes are a good idea all year-round, with warm socks in the winter.If you are doing business in the country, business attire (suit and tie) is generally called for in the corporate sector, but media for example generally dress more casually.For game viewing, a couple of neutral-toned items will be useful, but there's no need to go overboard. A good pair of walking shoes is also advisable.For the evening, if you are dining at an upmarket restaurant or seeing a show, smart-casual attire is recommended. Please consult your health-care provider 4-6 weeks prior to travel to ensure you are receiving all required vaccinations, and that the medication has enough time to take effect. We highly recommend the purchase of travel insurance with medical benefits, and that you bring any personal medication with you. Please also check with your health department prior to departure for any changes in health regulations.Required Immunizations/Vaccinations:• Yellow Fever- required for travellers coming from a yellow fever infected country. This also applies to those who have transited through a yellow fever risk country. It is otherwise not required or recommended. You should be vaccinated at least 10 days before you travel, as this will allow enough time for your body to develop protection against the yellow fever infection. Your proof of vaccination certificate will only become valid after this time.Recommended Immunizations/Vaccinations:• Malaria prophylaxis – highly recommended for all travellers (even if you are only visiting malaria-free areas as there has been an increase in malaria in southern Africa)• Hepatitis A – recommended for all travellers over one year of age• Hepatitis B – if not previously vaccinated• Typhoid – recommended for all travellers • Polio immunization – recommended for all travellers• Rabies – recommended for travellers spending a lot of time outdoors • Tetanus-diphtheria vaccine – recommended for all travellers who have not received a tetanus-diphtheria immunization within the last 10 years. • Cholera vaccine is not generally recommended, even though cholera outbreaks are reported, because most travellers are at low risk for infection.MalariaIt is inadvisable for pregnant women to visit malarial areas as malaria infection during pregnancy can be detrimental to both mother and child. Malaria can be prevented if you are sensible and take basic precautions, such as:• Use plenty of mosquito repellent. Some camps provide a locally made repellent but please bring your own as there may be skin sensitivity.• Wear long-sleeved shirts and trousers/slacks in the evenings.• Please use the mosquito net over your bed where supplied/available.• If staying in a bungalow or tent, spray with a suitable insecticide to kill any mosquitoes that may have flown into your room.• Mosquito coils are also effective. The city centre in downtown Johannesburg is not for casual sight-seeing. If you do want to visit central Johannesburg, we recommend that you take an organized tour or a private guide. This is also the case with Soweto, which is badly signposted and confusing to the casual visitor. ENTRY REQUIREMENTS PassportPassports must be valid for at least 30 days beyond the intended departure date. Please ensure you have at least two consecutive blank visa pages (not endorsement pages) in your passport.VisaU.S. citizens do not require a visa if visitng for 90 days or less. Non U.S. citizens should consult with your local embassy.Children under the age of 18Children under the age of 18 travelling to or from South Africa require additional documentation. Airlines will deny boarding and Immigration will refuse entry or departure, if these requirements have not been met. The following website is a great reference: http://www.drivesouthafrica.co.za/child-visa-checklist/. Please contact your consultant at Alluring Africa for further clarification.What is an unbridged birth certificate? An unabridged (unedited/complete) birth certificate reflects the particulars of both parents.Do you have to have the original document? No, a certified copy of the birth certificate is sufficient. It must be certified as a true copy of the original by a Commissioner of Oaths.Do the copies of the parents’ passports/ID’s have to be certified? Yes, they must be certified as a true copy of the original by a Commissioner of Oaths.How do you obtain approval from the Director General when you do not reside in South Africa? Through the nearest South African diplomatic or consular representative abroad.Yellow fever certificateA yellow fever vaccination certificate is required for travellers coming from a yellow fever infected country. It is otherwise not required or recommended. You should be vaccinated at least 10 days before you travel, as this will allow enough time for your body to develop protection against the yellow fever infection. Your proof of vaccination certificate will only become valid after this time. Language South Africa has eleven officially recognized languages, most of them indigenous to South Africa. English is one of these, and everywhere you go, you can expect to find people who speak and understand it. English is the language of the cities, of commerce and banking, of government and official documents. Road signs and official forms are in English. The President makes his speeches in English and at any hotel the service staff will speak English.Social conventionsPublic Holidays The dates of certain public holidays change from year to year – refer below. If a public holiday falls on a Sunday, then the Monday is also declared a public holiday.Jan 01 New Year’s DayMar 21 Human Rights Day Varies Good FridayVaries Easter Monday Varies Family Day Apr 27 Freedom DayMay 01 Workers DayJune 16 Youth Day Aug 09 National Women's DaySep 24 Heritage DayDec 16 Day of ReconcilationDec 25 Christmas DayDec 26 Day of GoodwillTime ZoneSouth African Standard Time, or SAST, is the name of the time zone used by all of South Africa, as well as Swaziland and Lesotho. South Africa operates two hours ahead of Greenwich Mean Time (GMT) throughout the year.National Emergency Numbers Department of Home Affairs (012) 810-8911 Medical Rescue Netcare 911 (011) 254-1911 Or ER 24 (011) 803-7707 Automobile Association 0800-010101 (Toll free) Life Line 0800-012322 (Toll free) Police 10111US EmbassyPhysical Address: 2 Reddam Ave, Westlake 7945Tel: +27 (21) 702-7300Fax: +27 (21) 702-7493Mailing Address: PO Box 9536 Pretoria 0001Tel: +27 (11) 290 3000Fax: +27 (11) 884 0396Website: southafrica.usembassy.govVAT The VAT rate is 14% and is levied on most products and services. Foreign tourists can have VAT refunded at a port of exit provided the value of each invoice for goods purchased exceeds ZAR 50.00 and the total value of all items purchased exceeds ZAR 250.00. To qualify for a refund, visitors must be in possession of a valid passport, valid tax invoices and must produce the goods purchased. Please note that a receipt stating “for information only” is not accepted by the VAT authorities. The document must stipulate that it is a VAT invoice and show the amount charged.